Music and Markets Tours invites you to join us this summer at the Grachtenfestival (Canal Festival), when Amsterdam’s picturesque canals resound with music. For eight memorable days we’ll thrill to the sound of outstanding concerts featuring prizewinners of international competitions as well as established virtuosos, and then be on our way to Brussels, from where we’ll tour the delightful Flemish towns of Bruges and Antwerp. The extraordinary locations in both countries will be as exciting as the music. Otherwise off limits, rooftop terraces, intimate ateliers, lavish gardens, and private homes are opened for the special events in Amsterdam. 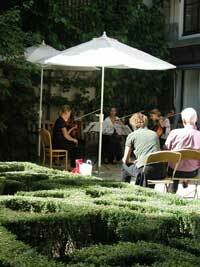 Behind the gabled facades of the canal houses are small private gardens – just perfect for a string quartet. 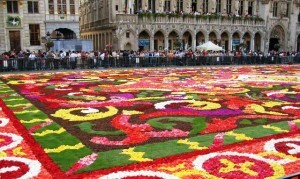 Add to this tours of the historic canals in romantic Bruges and stately Amsterdam, both on land and water; a visit to the city of Rubens, Antwerp, an introduction to best-buys in both countries, a day trip to the windmill-filled villages of the Zaandijk, and colorful open-air markets for a matchless experience in this living museum of the Low Countries. 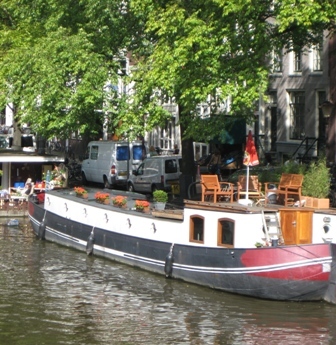 Amsterdam’s visitors share the canal with a special breed of homeowners.